View More In Plant Covers. No pesticide! Easy install. Organic way to keep birds and bugs at bay! Get all your apples, apricots, peaches, plums or persimmon covered so birds don't get them before you. For apple maggots and apple codling moth cover your apples when they are finger nail size to get the best result. Organic way to protect your fruit from birds and bugs. 2018 new material and highly water resistant. Easy install with twist ties on the bags. 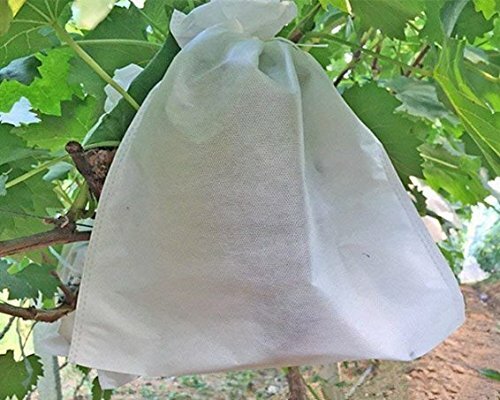 100 Soft fabric bags to protect your fruits from birds , bugs , Mediterranean fruit flies and sunburn. Applies to apples, pears, persimmons, dragon fruits, guavas, oranges, plums and other fruits. Get yours now so you can enjoy your own tree ripe fruits this year! Highly water resistant, No pesticides! Protect your apples, peaches, pears, persimmons, dragon fruits, guavas, oranges, plums, nectarines and other fruits from Mediterranean fruit flies, birds and bugs. Easy use twist ties included, install in seconds! Cover your fruit with the fruit protect bag, and tie to secure around branch or stem. This seals the opening of your fruit protection bag. Fruit protecting bags in bulk for your fruit trees ! Better than drawstrings bags. Fruit insect barrier & help to prevent the damage from the frost, and keep the temperature and moisture more stable for the fruit. Reusable, no more broken paper bags from rain or bird pecks. Bag Size: W: 11.8" ; L: 13.7". Twist Tie Length:4.3". Maximum Caliber：6.5"
If you have any questions about this product by LAVZAN, contact us by completing and submitting the form below. If you are looking for a specif part number, please include it with your message.